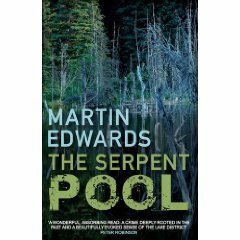 Martin Edwards writes, ‘Books burn in the opening scene of my fourth and latest Lake District Mystery, The Serpent Pool, just issued in paperback in the UK. And the man who owns the books, an avid collector called George Saffell, watches bound and helpless as the flames race towards him. Few areas anywhere that are as small as England’s Lake District (it is roughly thirty miles across) can boast such a rich literary tradition. William Wordsworth was the most famous of the Lake Poets, but Samuel Taylor Coleridge and Robert Southey still have admirers. Among novelists, Hugh Walpole (whose few crime novels are well worth a look, incidentally), Melvyn Bragg and nowadays Sarah Hall, have all used the landscape of the Lakes to great effect. As an essayist, Thomas De Quincey (who lived in Dove Cottage, former home of the Wordswoths) is beyond compare. De Quincey’s dark shadow falls over The Serpent Pool. Apart from ‘Confessions of an English Opium-Eater’, a masterpiece of hallucinatory writing, he was most famous for ‘On Murder, Considered as one of the Fine Arts’, and this inspires Daniel Kind, to study his work while writing a book about the history of murder. In so doing, Daniel encounters a range of characters with something to hide, including the secret behind the violent death of George Saffell. I hadn’t read De Quincey before working on this novel, and I came to admire his writing, even if I remain deeply unconvinced about the benefits of opium to the creative process. Martin, Arsenic Labyrinth is brilliant! (I believe it was a recommendation from Christine right here on her blog.) As my forbears were Cornish miners, I was doubly interested to learn of the dangers of their occupation. Great story, too. Now I shall have to read The Serpent Pool as soon as it comes to the U.S.